“Julian’s personal religion was both pagan and philosophical; he viewed the traditional myths as allegories, in which the ancient gods were aspects of a philosophical divinity. The chief surviving sources are his works To King Helios and To the Mother of the Gods. “He learned theurgy from Maximus of Ephesus, a student of Iamblichus; his system bears some resemblance to the Neoplatonism of Plotinus; Polymnia Athanassiadi has brought new attention to his relations with Mithraism, although whether he was initiated into it remains debatable; and certain aspects of his thought (such as his reorganization of paganism under High Priests, and his fundamental monotheism) may show Christian influence. Some of these potential sources have not come down to us, and all of them influenced each other, which adds to the difficulties.” For more on Julian visit here on Wikipedia. 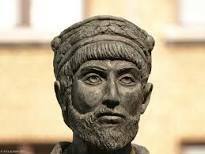 Continuing from the historical account from Wikipedia, Julian “restored pagan temples which had been confiscated since Constantine’s time, or simply appropriated by wealthy citizens; he repealed the stipends that Constantine had awarded to Christian bishops, and removed their other privileges, including a right to be consulted on appointments and to act as private courts. He also reversed some favors that had previously been given to Christians. 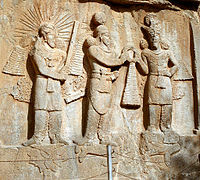 Sassanian relief of the investiture of Ardashir II showing (right to left) Shapur II, Mithra, and Ahura Mazda above a defeated Julian, lying prostrate. Rudolf Steiner states that “Julian was brought face to face with the deeper implications of the problem of evil and the relation of Christ Jesus to this problem. He hoped to find an answer through initiation into the Persian Mysteries [Mithraic and Zarathustrian] and to return to Europe with the solution. But unfortunately he fell by an assassin’s hand during the Persian campaign. It can be proved historically that this was the work of an adherent of Constantine. … In the following years the Augustinian principle triumphed – ideas that in any way echoed Manichaeism were forbidden, i.e. the inclusion of material ideas i spiritual thinking. The West therefore was driving to an abstract mode of thinking and in the course of time this mode of thinking permeated the whole of Western Europe. … Julian therefore was engaged in a titanic struggle. He finally attempted, by reviving Manichaeism, to bring about continuity in the evolution of the pagan Mysteries. … That he was doomed to fail was a necessity of the time. And we shall not understand the reason for his failure if we belittle his great achievements, if we fail to see him as a titanic figure, fighting for a realistic understanding of the relations between man and the universe. And it is of paramount importance today to recall these great moments in the historical evolution of the West. For we are living in an age from which we shall not emerge with a healthy outlook unless we make a fresh assessment of the aims of Julian the Apostate. It was not possible in his time – herein lies his great tragedy – to reconcile the old principle of initiation with the real essence of Christianity. Today this has become possible and we must not fail to translate the possibility into reality if the world and mankind are not to suffer evolutionary decline. People must realize the need for regeneration in all spheres of life and above all the crying need to restore communication with the spiritual world. 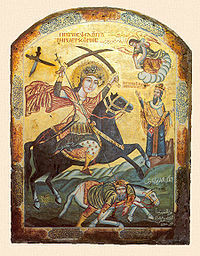 Coptic icon showing Saint Mercurius killing Julian. Julian understood the greatness of the ancient mysteries and had hoped to restore them for the guidance of mankind. He could not fully grasp Christianity as already in his time much was deceived and lost.